Tales from the merchant marine, these series of yarns to me seem to good to loose, are shared to amuse. To spin a yarn was a phrase much used by sailors, derived from, to sit together working on ropes and chatting. The yarns are individual insights into the characters and world of a vanished breed of men, the merchant seaman. In the old days the sea men were described thus, “wooden ships and iron men”. Each thread found it’s way to me via the research into a particular painting. While arguably not relevant to the painting they seem to good not to share so settle back and enjoy. From the son of a former British India Steam navigation Company man Barney Leeson. “my late Father was a Captain for BI , he would have sailed the very same waters – He was Master on the (B I ) ship “Chupra” that called Mombasa in the early seventies. 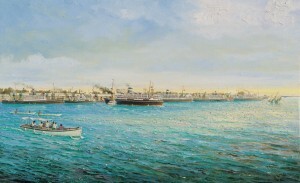 On an earlier trip to Mombasa on another ship holding the rank of cargo officer ( Chief Officer) he received a telegram from the London office wanting to know what had happened with a consignment of whisky – the receiver had complained he had no where to store the goods – he had allowed for a high percentage of breakage. My Father advised it must be the good stow he had planned on the ship. The real answer was that my Father whilst in London had spoken to the foreman of the stevedoring company loading the whisky – He said they could take one case to the side, provided they loaded all the other cases safely ! The usual practice was to drop the cases, so that the dockers could all ensure they got a bottle or two. Fathers method limited the damaged and everyone was happy apart from the poor chap in Mombasa who was not expecting so many cases to arrive safely“. From the painting “B I Sunday“. 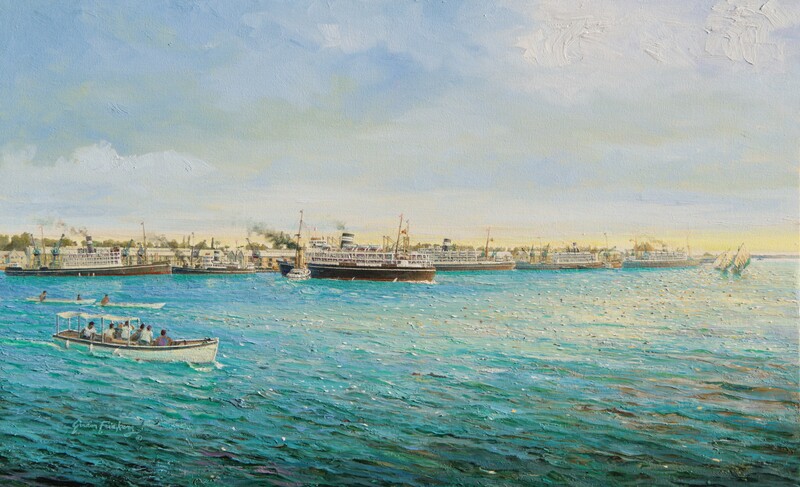 This may appeal to your sense of humour; in my earlier research into this painting a yarn was spun to me concerning a number of B I Engineers who upon returning to the port of Mombasa having celebrated with their ship mates “B I Sunday” as one must, were a little merrier than usual. A small number of them faced an annoyance. The officers of the furthest berthed “M” class ship reasoned their walk down the long quay after a night out was unduly long. For marine engineers, commandeering a steam engine left still with “steam up” was to much of an invitation to refuse. No problem for marine engineers to start a steam engine, they proceeded down the tracks, all going extremely well until the moment came to stop. Thankfully the speed was not excessive, the track end buffers were wrecked but did bring the engine to a derailed stop. A friend in Plymouth, a kindly Gentleman, has been typing some of my notes collected while researching “Emigration, Plymouth Cattewater”. There are several yarns that emerged with the story that don’t directly connect to the painting yet to me seem to fine a take to loose so ideal candidates for the new web site page Brotherhood of the sea . The ship featured and yes she is a real ship, is the 3 masted square rigged deep sea clipper “Samuel Plymsol”. The following gives an idea of “Samuel Plimsol’s”prowess, the latter entry gives cause for a smile, enjoy. 100 A1, 1444 tons reg. R. Boaden, late of THE STAR OF PEACE commander. This magnificent vessel has just completed the passage from Plymouth in 73 days, and having her cargo stowed on board will leave about 7th April. On the occasion of her only mishap a tropical squall carried away the bobstay, and down came the fore-topmast and main topgallant mast. It happened that a Yankee clipper was in company. In the true spirit of “the Brotherhood of the Sea” this vessel beat up to the dismantled Samuel Plimsoll and sent a boat off with a message to say she was bound for Australia and would gladly tranship the passengers and carry them on to their destination. This offer, Captain Simpson, who then commanded the Samuel Plimsoll, declined with thanks, so the American went on her way. 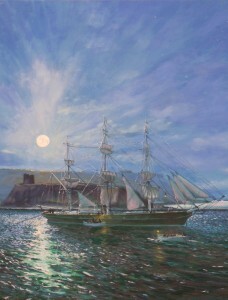 The men of the Samuel Plimsol laboured hard all day until the Aberdeen flyer had fresh masts aloft, after which she settled down to make up the lost time. Most nobly she did so, one week’s work in the roaring forties totalling 2300 miles. She eventually arrived in Melbourne, 82 days out. Some days later the Yankee arrived and her captain, quite correctly, at once went to the Samuel Plimsoll’s agents. He reported speaking to her dismasted in the Atlantic, at the same time he commented on her captain’s foolhardiness in not transhipping his passengers. The Samuel Plimsol had arrived a full week before the Yankee clipper. with label visible to us very much in the style of the Raj!. windows!! Thankfully the keys were found shortly afterwards. went missing he was at risk of being sent home. I was a lowly 3/O. traveling down to Durban for shopping. Enjoying your visit, found something you like? Share with friends, spread the word to all who appreciate the sea, fine art and history. You can help other people discover, enjoy, benefit from this remarkable, unique project widely know.